It’s taken a little over 4 years and 4 iPhone but it is finally here! Skype on your iPhone just like a phone call. You can sign in and then close the app and when a call comes in, it rings! You can also close the app while you’re on a call and stay connected! These are features we’ve all been waiting for! 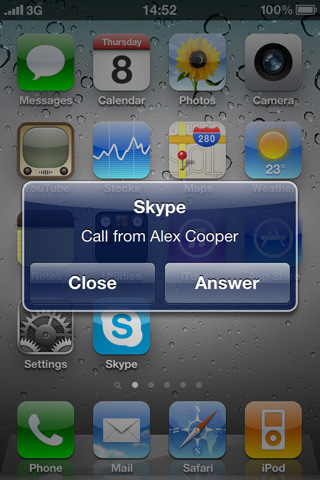 Now I know Skype has been out for the iPhone before, but this is the way it always should have worked. Previously, Skype for the iPhone would only let you make calls from the iPhone if it was connected to Wifi. Now you can make them even when on the 3G cellular network. It doesn’t say anything about EDGE so I’m guessing it won’t work there. I even got it to work on EDGE. Check the video below. There are also some other improvements with the recent update including enhanced call quality indicator and improved start-up time. See below for a complete list.